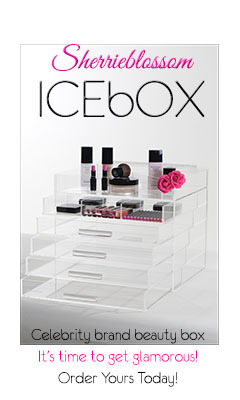 kandeej.com: If I was going to Fashion Week!!! I love these pants from Gwen Stefani's L.A.M.B. line....I even like the matching wrap-top. and if I could borrow this jacket with the feathers again from Stephen and Cosmo from SPEED on Melrose...my "day-day-dreaming-what-i-would-wear-to-fashion-week-outfit" would be complete! 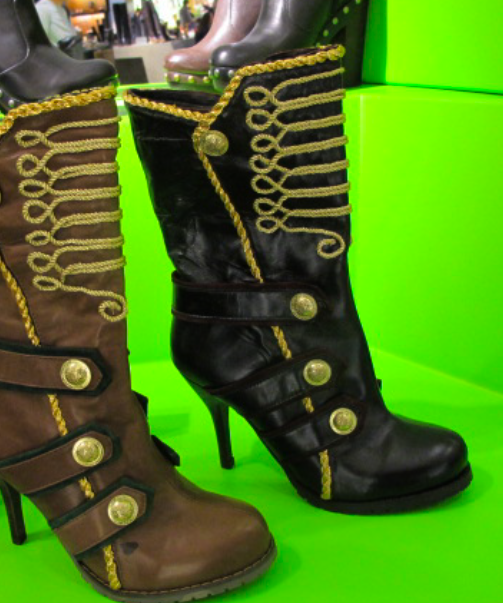 I have no idea who makes these boots....but I love their "pirate boot -ness"! please look at the beautiful, mirrored, disco ball-glam shoes at Patricia Field's!!! They are like Cinderella's glass slippers, but disco glamtastic! Those black heels are the hotness!! I love those black platforms and the disco ball shoes. How fun. Love ya Kandee! Keep it up glam sister! omg i WANT those last heels!! I love those pants, that tommy boy ones. they kinda remind me of army pants. Seriously, I have to have the mirrored shoes - who makes them? That is just a list made of WIN. Those Disco Ball Heels are incredible!!! They would make a LBD or skinny jeans and a flowy black cardigan look like a million bucks. I can't even think of ONE place I could wear them to - but they are seriously magical...I'm in love!! 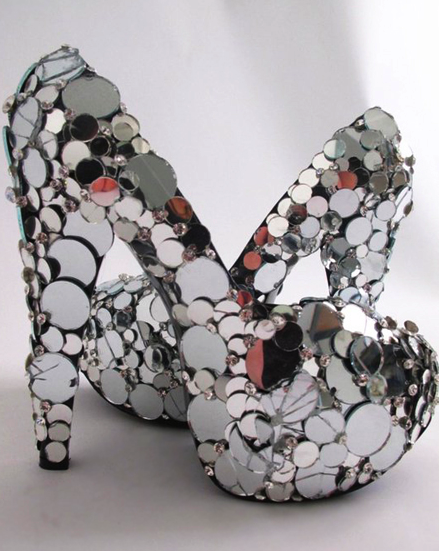 PS - Those amazing mirrored/disco ball shoes are FIFTEEN HUNDRED DOLLARS...yes- $1,500!! So gorgeous though... I'm glad I don't have the credit card nearby, because ...DAMN!! Wow those heels are to die for...very Lady Gaga!! I hope to make my blog a success and hopefully, be invited to NYC Fashion Week--Just like you. i love the L.A.M.B line! i like to wear pants more than dresses/skirts so when i find a nice pair that is both a bit fem and a little bit tomboy, esp if they have movement...love it! i have the irreguler choice heels, just mine are purple! thay are amazing and super comfy! I just got done watching your life story video for the first time and it broke me into tears. I didn't realize how much stuff you had been through. I don't think you realize how truly encouraging you are. I've never been through anything like that, but I know how it feels to be 'stuck' when following your dreams. I don't know you personally, but I thank God for coming across you through your blogs and youtube videos. I hope to meet you one day! You're going to get the biggest hug ever from me lol. God bless you and your family<3! Hi Kandee, I stumbled into your youtube make-up channel and I just loved watching your make up tips so much, because you are not only so beautiful but you have an amazing personality!!!! You have the type of character that brightens up my day!!! Then I started reading your blogs and I realized that you too love the Lord, so I was so excited to show my 3 daughters, how you can be beautiful and fashionable and still love God!!! So keep doing what your doing, you are a blessing to so many people!!! I am praying for you, and your beautiful family!!! kandee ı want to you give some idea about valentino day make-up and hair styles. I love the Patricia Fields mirrored pumps I could totally see myself wearing those all the time!!! And the pirate-esque boots are cute too!!!!!! Please check out my fashion blog I would love to hear your comments!!! Hi Kandee, I am hoping one of my notes on one of your pages will make it to you in time. I sent you a present and its been waiting so long they are going to send it back ... "ahhh!" I know you will love it, i hope you make it in time! <3 your frantic fan lol! Oh my gosh the shoes ! I love the black heels, and the mirror ones are so freakin awesome ! I had never seen ones like those ! Haha.